Who’s Got Control of Your Retirement Plan? Do you remember playing with that kid in the neighborhood who set up a game, and then changed the rules as the game went on to suit himself? Just like those games, you’ll never come out winning with your retirement plan if someone else sets – and constantly changes – the rules! Here’s one of those inconvenient truths: When your retirement savings are in a government-controlled plan sponsored by your employer, your employer can change the rules at any time. And so can the government. Despite the mass of paperwork your employer handed you when you first began your retirement plan, your employer’s retirement plan rules are not set in concrete. Employers can change their rules, even in midstream. For example, not too long ago, IBM decided to change its retirement plan rules. Up until that time, IBM gave employees their 401(k) match with each pay check. But some smart bean counter pointed out that Big Blue could save a bundle if they waited to give the match until the very last day of the year instead of throughout the year. Well, it’s a big deal to the hundreds of thousands of IBM employees who lose an entire year of growth on the match money. And if an employee is fired in November, he won’t get any match for the year. IBM pulled the rug out from under 400,000 employees overnight. Could your company be next in line to cut back your 401(k) plan benefits? And speaking of “Gotchas!” government-approved retirement plans have more strings attached than Pinocchio before he became a real boy. It’s like your money is locked up in a maximum-security prison. Someone else calls the shots – and you barely get visitation rights! Talk about not being in control of your money! Think about it: In government-controlled retirement plans – such as 401(k)s, 403(b)s, IRAs and Roths – the government tells you how much you can put in your plan, and what you can and cannot invest in. The government regulates how much you can borrow and when and how you must pay it back. The government tells you how long you have to wait, before you can begin to use money in your retirement plan – your own money! Then they force you to withdraw the money from your plan by a certain age and pay taxes on it – whether you want or need the money or not! Roth plans currently have no required withdrawals, but the government is even considering changing that. The truth is, once you put money into a government-controlled retirement plan, you no longer control it. Your employer and the government control it. Either can change the rules of the retirement plan game any time they want. The prison warden has your money under lock and key, and while your money’s in the slammer, he can force you to accept any new restrictions or regulations he comes up with. Virtually every year the president releases a new budget proposal which includes provisions that will directly affect your retirement savings if they become law. Huh? Our government can even dictate to us how much retirement savings is “enough”! Maybe you think that if you have a self-directed IRA, you don’t have to operate with the same restrictions as other plans. Nope! Self-directed IRAs receive the same tax treatment as traditional IRAs, and they’re subject to the same fees and expenses. The term “self-directed” just means you can determine what investments to place in the plan – but even that is within limits set by the government. Is it even possible that the government may actually take over your retirement account? Not long ago the head of the Consumer Financial Protection Bureau revealed that the Bureau is weighing whether it should take a role in “helping” Americans manage the money they’ve put into retirement savings. Why would the government want to gain control over your retirement account? The government created these plans, and they know where your money is and how much you have there. It’s the easiest and fastest money for them to get their hands on when they need to find some cash. Is There a Better Way to Save for Retirement? Yes! The alternative retirement plan I discuss on this website, Bank On Yourself, has no such strings attached. There are no penalties for taking “too little” each year, and none of the mandatory minimum annual withdrawal requirements that are common to conventional retirement plans. 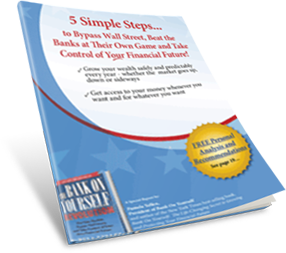 If you’re ready to re-gain control of your retirement savings, download a copy of my FREE Report, 5 Simple Steps to Bypass Wall Street, Fire Your Banker, and Take Control of Your Financial Future. You’ll also receive a free chapter from my latest New York Times best-selling book. It’s not too late to get your money out of prison! But you should do it now, before they slam the door shut and throw away the key! Thanks for sharing this information about retirement planning. My wife and I are in our late 20’s and are trying to get off on the right foot so that we can retire how and when we want to. I will admit that there are so many different options available that it makes deciding on one very difficult. Your article gives me a good place to start. Thanks for the info!